My new book is hot off the press! It is always exciting to have the actual book in my hand and see the real manifestation of all those days of work. 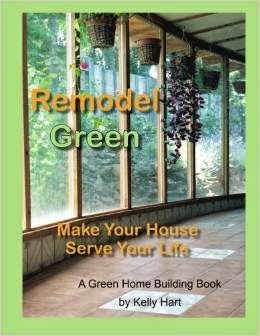 Remodel Green: Make Your House Serve Your Life is the second book in my series about green home building (the first was Rolling Shelter: Vehicles We Have Called Home) and it chronicles much of the personal remodeling I have done over my life. I organized the chapters to focus on specific aspects of green remodeling, using examples from my experience to illustrate the points I make. The book is lavishly illustrated with photos from all of those projects, so it is a fun book to browse. My dear friend, Lee Temple from www.PrimaMundi.com, wrote a fine Foreword for the book, placing its message in the greater context of global environmental awareness. To remodel an existing structure to suit your needs is fundamentally a sustainable activity, because it means that you are salvaging a considerable amount of embodied energy rather than causing all of the new embodied energy that any new building would entail. I write about how to fit a house to your needs, and how to assess what those needs really are in the first place. I emphasize the value of compact design and show how I remodeled a garage to create a large office, a small shop and attic storage space. I also explain how we remodeled a small manufactured home to provide all the space we needed. I delve back into the 1970's when my wife and I joined two of my sisters and their families to make homes together in an old Catholic kid's summer camp. Our share of the space was a rickety row of cabins joined together with an exterior walkway, so you can imagine how challenging that was. One chapter is about allowing the sun into your house for passive solar heat and shows how I have done this on several occasions. I created a sunspace addition on the south side of one house, and in another I added extra windows, along with thermal mass. In Mexico, I enclosed two different patios to create passive solar rooms. Strategies for passively cooling your house are explored, with examples of wrapping the house with radiant barrier foil, adding more thermal mass to the inside, or creating bermed walls. I write about more exotic measures, such as tempering the incoming air by ducting it through underground pipes, or creating wind catchers, as is commonly done in the Middle East. I explain how to go about adding photovoltaic panels to produce all of the renewable electricity you might need. In my case this was a net metering situation connected to the grid, but also combined a backup battery for times that the grid might be down. Solar thermal panels for domestic hot water are also explained. One chapter is devoted to water conservation, with examples of two separate rainwater catchment systems. I have had experience with several composting toilets; one was Swedish Clivus Multrum design that I fabricated myself. I write about the pros and cons of compost toilets. I advocate the use of local, natural, and recycled materials for building, and show many examples of how I have done this with my remodeling projects. Doing this can often save a lot of money, which I consider to be another sustainable attribute. I deal with nutritional sustenance, through growing your own produce with gardens, greenhouses and cold frames. And then I show how I have created several naturally cooled pantries or root cellars to store the produce that is grown. Then I go back in time again to that family commune at the summer camp and write about how beneficial it was to share so many facilities, as well as social and logistical benefits. The last chapter is a look toward the future and how important it really is to pay attention to how we use materials, resources and energy, so that the future will be pleasant for us and our progeny. Hi Kelly. It sounds like "Remodel Green: Make Your House Serve Your Life" is fairly comprehensive. I wonder what your thoughts are on the fact that solar PV looks more financially attractive than ever for homeowners. I am a strong proponent of PV and outlined in detail how I recently installed a system on my own house. Have you heard of the new solar panel mounts for east/west facing roofs? I think its a new thing now, but I have not seen much written about them. Yes, such mounting systems do make it possible for less than ideal roof situations to be used for PV systems, and this is a good thing. A south-facing roof is still the best, but can't always be provided. With so much pollution and almost everything artificial, green is the thing to go to save our present and the future.